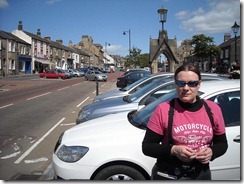 Helen and I went out yesterday for a ride up to Barnard Castle and back. The weather looked like it would be nice all day so we set out at about 10:45am. We left and headed over to Clitheroe Services to fill up as usual. Not long after we left home we past about 40 cruisers on the M66, not sure where they were going. We then passed about 50 scooter riders on the A56 who had parked up in a very dangerous position on the edge of the inside lane. We arrived at Clitheroe and found it was also very busy with bikes. 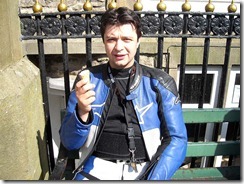 We had been hoping it would be relatively quiet out as there was a bike show on in Stoke and another one in Durham. We then headed over to Settle on our usual route via Sawley and Wigglesworth. Just outside Settle we joined the A65 and headed up to Devil’s Bridge at Kirkby Lonsdale. Devil’s Bridge was busy but it wasn’t absolutely heaving, so we only stopped for a brief break. We left Devil’s Bridge and headed up to Sedbergh on the A683. It was fairly quiet up here as usual and so we made nice progress. We then headed through Sedbergh and continued on the A683 towards Kirkby Stephen. We then joined the A685 and headed through Kirkby Stephen to Brough. At Brough we joined the B6276 and straight away hit some loose chippings, thankfully it was only a short run of about one mile. We then headed on to the B6276 proper and had a good run over to Middleton-in-Teesdale. We passed by Selset Reservoir and Grassholme Reservoir before turning right on to the B6281. 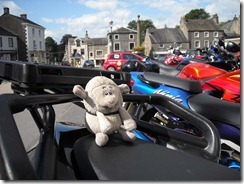 We then joined the B6277 and headed over to Barnard Castle for a late Lunch. 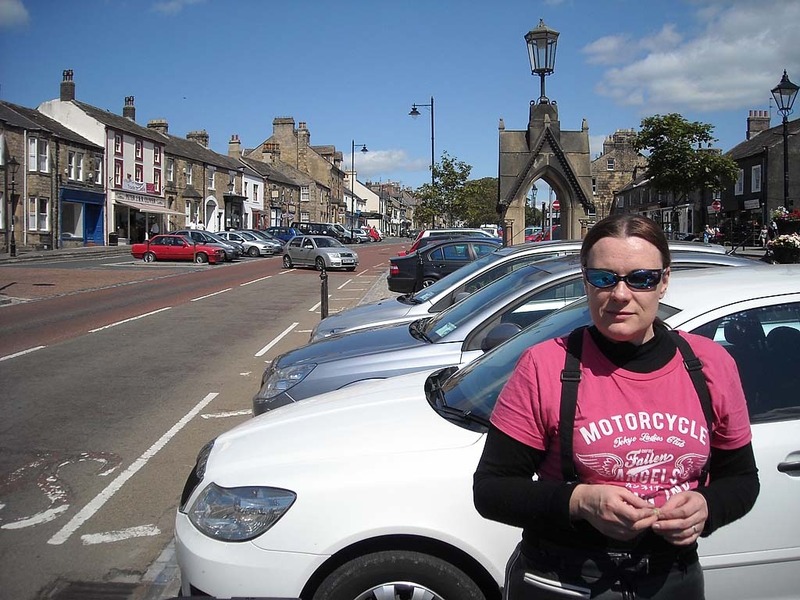 It was fairly busy in Barnard Castle but managed to park the bikes up easily. We left Barnard Castle and headed across the A66 and on to Arkengarthdale. We then turned right and headed up to Tan Hill. We encountered more loose chippings here although these had bedded in a bit more. We passed by Tan Hill and then turned left and headed down t he famous hairpins to Keld, thankfully there was no loose chippings here. As we turned left on to the B6270 we came across more loose chippings, looks like the road workers have been very busy of late in his area. We then turned right and left the chippings behind and headed over Buttertubs Pass and down into Hawes. The top of Buttertubs Pass was full of sheep again, the majority of which seem to like congregating in the middle of the road. We passed through Hawes and headed over to Ribblehead Viaduct on the B6255. We turned left at Ribblehead Viaduct as usual and headed back to Settle on the B6479. 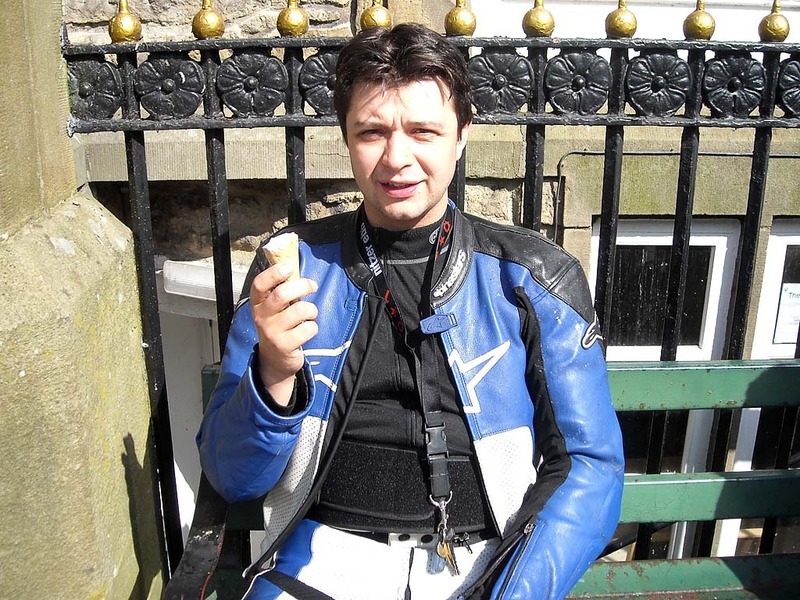 We stopped in Settle briefly to get an ice-cream each from the Ye Old Naked Man Café. We then left Settle and headed back to Clitheroe via Wigglesworth and Sawley and then turned left and went over Pendle Hill and down into Sabden. We then continued on to Simonstone and then followed the A56/M66 home.